Whether you are a utility, construction or service company, you probably have trucks with boxes and sidewalls and you might wonder what the best practice is on using your Bednet®. 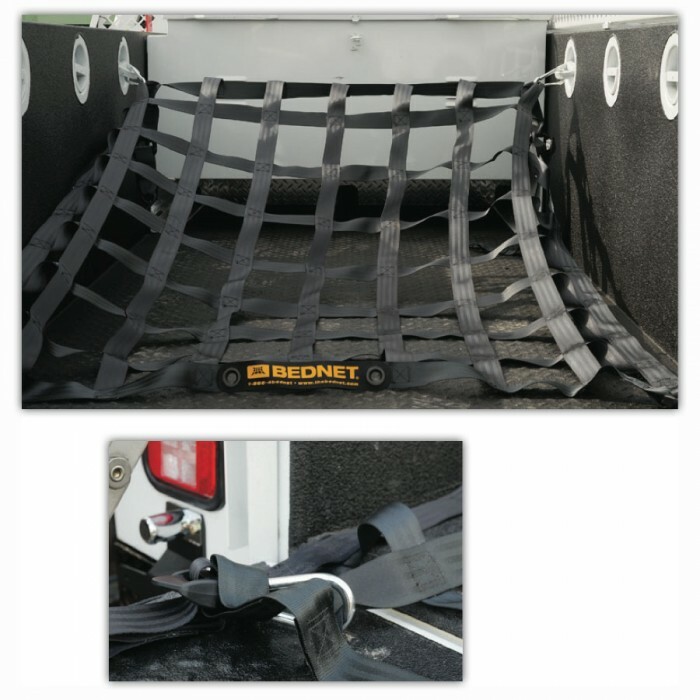 Your Original Bednet® Cargo Restraint is very versatile and can be easily adapted to many different truck bed sizes and configurations. For any bed with sidewalls that limits access to interior anchor points, the Bednet® can be semi-permanently installed at the cab end of the bed using carabineers. All adjustments are them made from the rear only. This will limit the need to ever physically enter the bed, and make covering the load a snap. Hook a carabineer into each of the anchor points at the front of the truck bed. 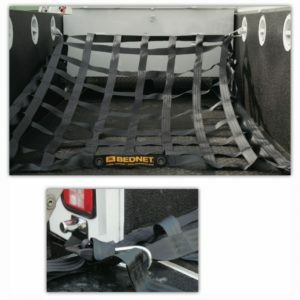 Spread the Bednet® Cargo Restraint over cargo area so that the Bednet® logo faces up and towards the tailgate. Leave the integrated adjustment straps at the front of the net rolled up and un-deployed. Position the net so that the rear edge is nearly flush with the tailgate or rear anchor points. At the front anchor points, feed the carabineers into the closest webbing strand on either sides. Please note, the appropriate strand may not be the perimeter strand, but possibly an interior strand. This will leave some slack net against the cab. Once installed, test the fit by tightening the rear integrated adjustment straps. If they pull taught, you are done. If there is a bit of slack, re-attach the carabineers to the next strand towards the tailgate which will give you more slack net against the cab. Some nets are designed to fit many different truck body lengths. A long body would leave a little slack, while a short body would leave more. Once finished, make all adjustments from the rear. When loading, simply push the net out of the way, load and cover. Remember, loads should always be placed over the axle or nearer to the cab for a better ride. Don’t worry about the elements! Bednet® products are made from automotive seatbelt webbing which is uv stabilized. Leave it on and you will always be ready to roll. Great advice for where to place the load weight, I wish someone had told me that. I remember making the mistake of placing most of a load in the middle with nothing holding it. Let me tell you, worst car ride ever. Just remember to watch for the load placement.